The coldest temperature so far this winter has been down around 9° F, and three of my citrus plants still look fine. In the ground, outdoors! Technically, they are a citrus relative, Poncirus trifoliata, also known as trifoliate orange. The leaves resemble citrus leaves, the white flowers resemble and have the fragrance of citrus flowers, and the fruits, orange and an inch-and-a-half across, resemble citrus fruits inside and out. Too bad poncirus is barely edible, although it can be squeezed for juice that is diluted and sweetened to make an -ade. Even if poncirus was not edible, it would be worth growing for its beauty, especially the Flying Dragon variety with its contorted, green (and thorny) stems and leaves. My three poncirus plants started out as seeds plucked from a fruit on a plant growing against a brick wall in northern New Jersey. The seeds sprout and grow easily. After growing one year in pots, into the ground they went. The first couple of years, winter lows of -10° and -19° killed them back to the snow line. They’re allegedly cold-hardy below zero degrees F., but that hardiness comes with age. Also, the pattern of cold development and its duration affects cold-hardiness. This year, so far, the plants look fine from top to bottom. Poncirus is close enough to citrus botanically that its been hybridized with citrus to make more edible, albeit less cold-hardy, hybrids. Like the citrange, from the mating with sweet orange, hardy to 5 to 10°F. A few varieties of citrange have been developed, all billed as “approaching edibility” but, like poncirus, making a good -ade. Mandarins (tangerines, C. reticulata) are also among the hardiest of citrus, and they taste very good straight up. The deep orange fruits of the variety Changsha are sweet and juicy, and I actually have a potted plant from which I’ve been trying to coax fruit for more than 5 years — or so I thought. Today I checked the original bag in which I received cuttings of the alleged Changsha. Turns out the name scrawled on the bag is Changshou, not Changsha. Bummer, I was looking forward to Changsha. Changshou is another hardy citrus-type fruit, actually a kumquat, from the closely related genus Fortunella. Kumquats are cold-hardy to between 10 and 20°F., and are a fruit I’ve grown — indoors in winter, outdoors in summer — for many years. Kumquats, like poncirus, hybridize readily with citrus species. Hmmm, why not combine the hardy kumquat with the hardy mandarin? It’s been done, the result of the mating being the Nippon orangequat, hardy to 10°F. and with a mild flavor, if left to hang on the plant long enough, and, like a kumquat, having an edible skin. Except for poncirus, I’m not really hoping to harvest any citrus-type fruits from outdoor plants anytime soon, perhaps ever. Surviving the depths of winter cold is one thing. The plant also has to be able to ripen its fruit within the growing season. My Meiwa kumquats, for instance, ripen in February, and I expect even a few nights in the 20s would turn the fruit to mush. For now, then, I continue growing the more edible citrus-type fruits in pots that winter indoors. Still, poncirus, that citrus look-alike will look cool out in the landscape. This entry was posted in Uncategorized and tagged citrus, kumquat, poncirus, trifoliate orange. Bookmark the permalink. Trackbacks are closed, but you can post a comment. Given ideal conditions (say, against a south facing brick wall and with good wind protection), what’s the lowest zone in which you could grow a yuzu outside? I’m guessing that in a lot of Zone 7 you could clear the 10F minimum, but it’s jut hard to imagine a true citrus tree surviving a week where the temps max out in the 20s. Speaking of citrus-ish trees, have you tried growing an Australian finger lime? Any thoughts? I would guess that Zone 8 would be the minimum for yuzu. As you wrote, the duration of cold is also important. Dipping for a few hours to 10°F is a lot different than days only up into the 20s; the latter could be more damaging. I haven’t tried the Australian finger lime. I’m more into citrus that I can actually eat rather than enjoy as a flavoring. That’s one reason I like kumquats; you get to eat the whole fruit, skin and all. And, I like their flavor. I might next plant satsuma or clementine. I am looking for a grafted Yuzu lemon plant. Do you have an idea where can I find it. Thank you so much but they are sold out. Just google it. I’m sure there are other sources. Hi, I am writing from Japan! I am amazed at the variety of fruit trees you grow. I thought poncirus trees were very Asian, and yet, you have the flying dragon poncirus! 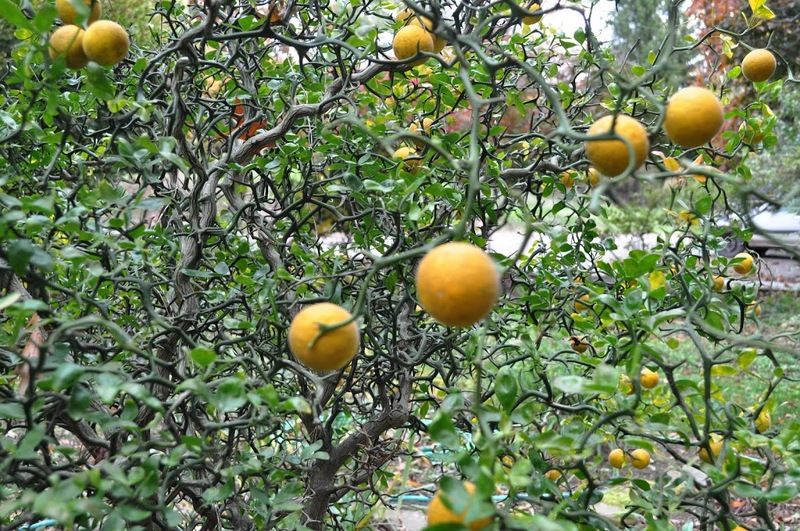 The flying dragon poncirus is sometimes used as the root stock for citrus trees in Japan, but such plants tend to be much more expensive than plants with ordinary poncirus root stocks. A citrus plant with a flying dragon poncirus is said to remain dwarfish, but the plant’s longevity tends to become shorter. That is what they say, anyway. I am a proud owner of blood orange trees – a Moro and a Tarocco. They are fruiting this winter for the first time! I have tasted half of the fruits and they are delicious! We get blood oranges from California and I have always wanted to grow them myself. I am thinking of expanding my citrus collection to include some satsumas — in pots, of course. I have planted Flying Dragon as a protective hedge for my garden. I live in central Pennsylvania in a forested area. I have heard it is invasive and I am afraid I have created a real problem. My guess is that it won’t prove invasive in central PA. I only have seen seedling right beneath the other plant. I don’t think animals eat the fruit and spread the seed. Does anyone know if this is so?